We who enjoy the benefits of the modern Church forget how much Joseph Smith still had left to do at the dawn of 1843. In Joseph’s quest to restore the marriage system described in the Old Testament (and hinted at in the Book of Mormon) he had secured the support of his apostles and several close associates (male and female). Joseph had also largely gotten rid of the “sort which creep into houses, and lead captive… women laden with sins…” 1 and provided for the women taken in sin. However Joseph still had to convince the thousands of Mormon converts of this marriage doctrine, in the face of all the scurrilous rumors they’d heard or inferred. From January 1843 to the end of May 1843, Joseph began to extend his teachings to those individuals who had been wounded by the rumors about “spiritual wifery.” One of these was Joseph’s older brother, Hyrum Smith. Of the women who had been wounded, the best documented case involves Emily Partridge. 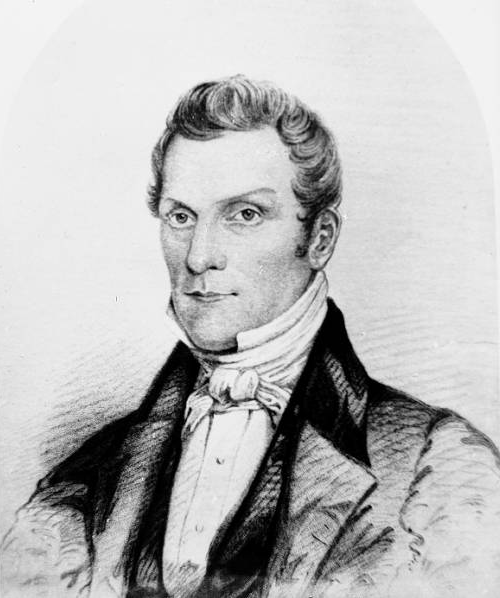 Hyrum Smith was almost six years older than Joseph Smith, and became the oldest surviving son of Lucy Mack [Smith] andJoseph Smith Sr. when Alvin Smith died in the 1820s. Hyrum supported Joseph throughout their lives together. When it came to the Church Joseph restored, Hyrum was one of the first to be baptized, was one of the Eight Witnesses testifying of the reality of the golden plates that gave rise to the Book of Mormon. When the Church was organized on April 6, 1830, Hyrum Smith was the oldest of the six charter members. Hyrum was an early missionary, led early congregations, marched with Zion’s Camp, and was one of those imprisoned in Liberty Jail with Joseph Smith. When Father Smith died, Hyrum became Presiding Patriarch of the Church. A few months later Hyrum was made Assistant President of the Church and ordained to the office of apostle. Yet though Joseph had taught plural marriage to the other apostles, he was unable to get Hyrum to accept plural marriage until May 26, 1843. By 1843, practically all those who were members of the Mormon Church had become aware of John C. Bennett’s accusations against Joseph. However the accusations raised particular questions in the minds of young ladies who had been questioned during the desperate investigations that led to Bennett’s expulsion. Edward Partridge died of ague in May 1840, leaving his family ill and without support. Two of his daughters, Emily (16) and Eliza (20) determined to “hire out” as maids. Joseph and Emma Smith had taken them in, providing Emily and Eliza with the necessities of life in exchange for their help around the homestead. Emily clearly never realized that spiritual wifery was not the same thing as plural marriage. What Emily could not know is whether Joseph and Emma and others living in the Smith homestead noticed Eliza’s depression and Emily’s refusal to be in a situation where she was alone with Joseph. Emily turned nineteen on February 1843, a year after the conversation with Mrs. Durfee. During the intervening months, Emily had sorted her feelings and decided she would be willing to receive Joseph if he ever tried again. On March 4, 1843, Mrs. Durfee told Emily Joseph wanted to speak with her at the home of Heber Kimball that evening. When Emily asked what Joseph wanted, Mrs. Durfee replied she thought Joseph wanted Emily for a wife. Emily worried all day about the interview, to the point that she didn’t change out of the clothes she’d worn to do the washing. Throwing a cloak over herself, Emily told her sister Eliza she was going to visit their mother, which she briefly did. Then Emily proceeded to the Kimball home, but found only the children at home. She waited until Heber Kimball and Joseph arrived, but then the children were sent to a neighbor and Kimball told Emily to leave as well. As Emily hurried away, Heber Kimball called after her, eventually getting her to return to talk with Joseph. On March 8, 1843, Joseph similarly “wed” Eliza Partridge. Eliza was more reserved than Emily and passed away before the Temple Lot trial, so we do not have any details specific to Eliza Partridge’s March 1843 marriage to Joseph. Emily and Eliza Partridge had presumed that Joseph would re-enact the high pressure sexual importuning they would had heard about in 1842. However the reality in March 1843 appears to have been ceremonial, unconsummated marriage – wholly other than what they had feared. With the background of these stories involving Hyrum Smith and the Partridge sisters, let us look at all the plural marriage activity taking place in early 1843, prior to Emma’s decision to openly participate in Joseph’s marriages to plural wives. As mentioned previously, Emily and Eliza Partridge married Joseph Smith on 4 March and 8 March respectively, a year after Emily refused to allow Joseph to talk with her or give her a letter. During the early portion of 1843, Joseph Smith reached out to a handful of men and women to invite them to enter into plural marriage. The men who took on plural wives during this period were very close to Joseph and appear to have been reaching out to relatives or converts who reasonably could have been spooked by Bennett’s accusations. As for the women who became plural wives in early 1843, the documents that exist indicate the woman had serious reservations based on either knowledge of or suspicion regarding Joseph Smith’s involvement in plural marriage. Yet time and again these women did gain a testimony that either plural marriage was not the evil they had feared or that the man involved was upright and noble. The number of English converts involved in marriages during this first portion of 1843 is unusual, and may be associated with the disproportionate damage Bennett’s activities and accusations had done to English converts. Marriages entered into prior to April 1843 did not appear to have a sexual component at that time, based on the reproductive history as well as written statements in some cases. But the April plural marriages entered into by William Clayton and Joseph Bates Noble show that sexual relations between men and their plural wives did occur prior to Joseph’s death. I was surprised to read that Hyrum did not accept plural marriage until May 1843. I had thought for some reason that he had been involved much earlier than that. I am not challenging your claim; this is just new information for me. I dare say Joseph attempted to get Hyrum to accept plural marriage before May 1843. Also, Ruth Vose [Sayers] claimed in 1869 that Hyrum officiated at a February 1843 sealing with Emma in attendance, but it seems she got the year wrong. The description of the conversation on the fence rails was delightful to read, by the way. However Joseph probably would have lived longer if Hyrum had remained unconvinced of plural marriage, since Hyrum was the one who mangled introduction of the revelation to the High Council. In June 1844 the focus of most the anger was on Hyrum, as many saw him as a second Bennett, advocating plurality and presumably the associated sexuality. This is probably an odd question, but what’s the deal with so many instances of plural wives being sisters? I know two of Joseph F. Smith’s wives were sisters, too. Is there something that makes having sisters as ‘sister wives’ more desirable than not? I don’t think it’s an odd question. There were definitely a *lot* of sisters who became “sister wives.” Beyond the obvious ones, we also have the instances of sisters who almost were sister wives. Like Mary Ann Frost [Stearns Pratt] and Olive Frost (Joseph apparently tried to get Parley P. Pratt to marry Olive, but she ended up with Joseph instead) and Louisa Beaman and Mary Adeline Beaman [Noble]. I think there were multiple benefits. First, during times when polygamy wasn’t practiced openly, it was less suspicious if a woman was living with her sister and her sister’s husband. Second, sisters usually had other reasons for loving one another, so had more breadth for creating a harmonious household than two women who weren’t coming from the same family culture. Third, sisters would be more honest with each other about the merits of the prospective mutual spouse, so a thoroughly good man would be able to have a chance with the sister of his current spouse. Fourth, there is the history of Jacob being married to Rachel and Leah, full sisters. Fifth, the children produced by sisters married to the same man would have the same grandparents, meaning they would be more genetically similar than children engendered by a man with women who were not sisters. In my own ancestry, all three biological daughters of Elvira Annie Cowles ended up marrying the same English widower, and part of why I think John Whitaker Taylor married plural wives in 1901 was the prospect of marrying sisters on the same day (he’d earlier wanted to marry his two pre-Manifesto plural wives (Nettie Woolley and Nellie Todd) on the same day, but Nettie got mad and refused to participate in a joint marriage ceremony–Nettie was also the wife who refused to participate in the big family vacation/campout/honeymoon when John W. Taylor married Ellen Sandburg, but ironically she therefore is the one who leaves behind a lovely letter welcoming Ellen into the family). Once we get into Deseret, women would sometimes insist a husband marry a valued female, either a relative or simply a woman who had become dear to the family. This happened with Elvira’s widowed step-daughter Sarah, when her sister-in-law, Caroline, and her dead husband’s brother were asked to settle Cache Valley. Caroline insisted her husband marry the two wives of his deceased brother and bring them with. Similarly Mary Bell (Mary Leamon [Bell]’s young daughter) had become an integral part of the Joseph Leland Heywood family as his ward. When she turned 16 and a French boarder in the Heywood home became infatuated with the intelligent, comely girl, Heywood’s wives told Heywood to marry Mary to keep her in the family. Martha Spence [Heywood]’s diary talks about a lot of silly girls with faults, but she never says anything negative about Mary Bell. From a man’s perspective, I imagine it would be daunting to marry sisters. They would have so much shared history, and there’d be hell to pay if you managed to offend either one of them. There’s a very faithful high priest in our ward who married his deceased wife’s sister. Meg: re: hell to pay if husband offends polygamous wives who are sisters. I came up with a humorous answer to the “how many wives do you have?” question on my mission, and have used it since: Estoy buscando la primera. Slightly modified in English: I’m [still] looking for my first. ….. and there’d be hell to pay if you managed to offend either one of them. My wife has three sisters and when they all get together they sometimes try to be the alpha female and fight like cats. But if some one bad mouths one of the sisters there is hell to pay. Blood is after all thicker than water. Almost as bad as attacking Mormons regarding polygamy. We have the most ambivalent feelings about it, but try to attack it from the outside and we get all bristly about it. Reading an advance copy of Paula Kelly Harline’s The Polygamous Wives Writing Club: From the Diaries of Mormon Pioneer Women, coming out from Oxford University Press in June 2014. One fact she mentions was the large number of polygamous wives (11% I think) who where actual sisters. When travel is so difficult, women would often wish to see their families more often than was possible. The benefit of not being separated from a sister would be desirable if you are sisters that love each other. Too many times a woman who married had to leave her family and risk never or rarely seeing them again. They didn’t have phones, they didn’t have cars. Getting married could feel pretty lonely. Sisters would have spent their entire lives in constant daily contact, sharing the work of a home. Most sisters would consider it a benefit to continue the relationship on a daily basis.